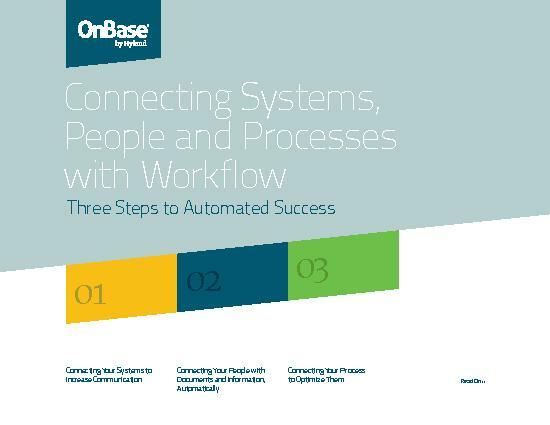 Download the E-book: Three simple steps show how to use document workflow to optimize your processes and increase the speed and accuracy of your lending institution. From accounts payable to human resources and contract management, workflow expands beyond banking processes to eliminate paper across your financial institution. Right now, many lending institutions are realizing they need document workflow capabilities beyond what their core banking platforms provide. Maybe they don’t know it yet, but they need electronic document workflow to help them automate and connect business processes so they can handle loans quicker and more efficiently. And so they can easily provide documentation to external stakeholders. Connecting Your Process to Optimize Them Download the e-book to learn more.